If the path between us and the achievement of our dreams was a straight line, would we consistently be faithful? I wonder, but I’m not optimistic. With a clear, wide, and open path to my dream, I might be inclined to believe I could do it all by myself. In achieving my God-Sized Dreams, I need to rely upon Faith. I am as independent a soul as you might find, which is sometimes a good thing, but more often is a decidedly NOT good thing. With age comes wisdom and the deepening of my faith, and for me it arrived in the form of at least three lessons. I accept that a) I am NOT in control, b) I am irreparably broken, c) the definition of insanity, AKA doing the same thing over and over again and expecting a different result is not a strategy for living according to God’s Will for my life. I NEED God. I know God planted dreams within me-you do too, even those you haven’t fully formed and articulated yet. We would do well to remember that the less we do on our own, the more God can do through us. Since we are not in control, we cannot manifest those God-sized Dreams. The moment we get ahead of ourselves, those once clear straight paths gets crooked, knotted, enmeshed, and stay that way. Let’s pray and agree to rely upon God to see the realization of our dreams, because they do not belong to us alone. So, let’s get to my lessons, and maybe, just maybe you’ll see yourself in my struggle. I AM NOT IN CONTROL. This one is both easy and hard. God alone provides everything I have ever needed, and I learn every day, that it is solely the Grace of the Father by which I am endowed. Whatever dreams He has poured into my heart or yours He will equip us to pursue and achieve. He leads, we follow. End of the lesson. I AM IRREPARABLY BROKEN. I spend an entire year writing about brokenness, and learned that it is a powerful and precious gift. Being broken once frightened me, but I am no longer afraid. Confessing my brokenness allowed me to go to the deeper places with God, to trust. To grow. To learn, but not to heal. I don’t want to be unbroken. My brokenness reminds me that I must stay close to His Throne, as it is His Grace, His Love, His Presence within me holding me together. (<==== Click to tweet) You can go it alone if you want to. I’m good. End of the lesson. THE DEFINITION OF INSANITY. Albert Einstein is credited with this definition…(God speaks to us in so many ways). If what you’ve been doing hasn’t been working, stop; it’s time to make a change. If what you’re doing isn’t getting you any closer to that God-given dream, try this. 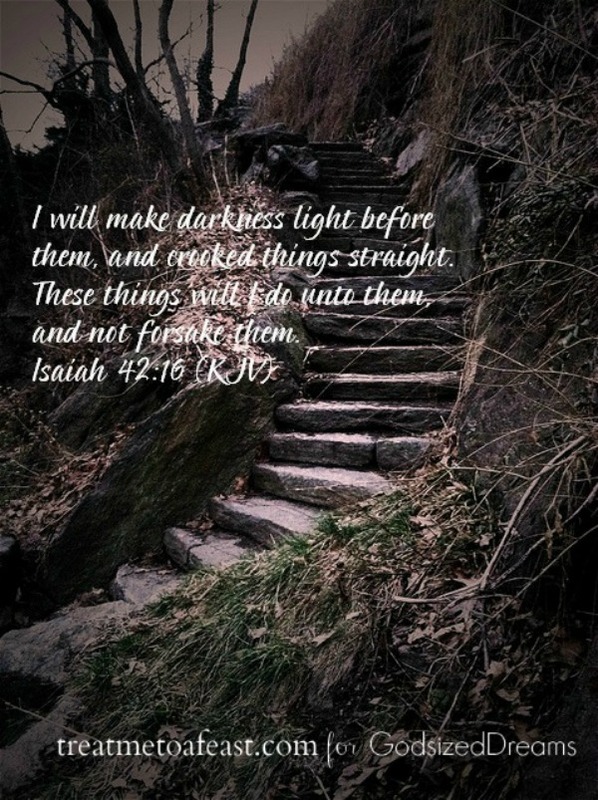 I will make darkness light before them, and crooked things straight. I am all crooked lines, but have not lost hope. (<==== Click to tweet) Neither have I lost sight of my dreams, even if my incessant trying hasn’t gotten me all the way there yet. It is time for us to try something new. If crooked paths aren’t getting you any further down the road, try more God. So much good application here, Chelle, not just to dreams. What a God-dependent way to live every day of life, fully leaning on His plan and His guidance. I’ve learned that no matter how much I may work at it, I really have little control of things that are out of my hands to begin with. Thanks, and Amen. Once we really internalize that “little control” thing (read ABSOLUTELY ZERO), there is a Peace that suffuses that truly does defy explanation or understanding. That is the way of God, and I am eternally grateful. Love your words and your support. Amen and amen.Your faith through your trials has encouraged me more than you know. God bless, friend. What an encouragement your words are to me. Knowing that my lessons might bless someone else makes them almost tolerable, to God be the Glory. Thanks always for your prayers, your friendship, and your unyielding support. Thank God we don’t need to straighten out our own crooked paths…. Fantastic post! I read this before going to work this morning and I’ve been thinking about it off and on since then which I would say is a pretty good indication that there are principles here I need to apply to my own life. Thank you Chelle! We’ll apply them together. I must confess that I am better at seeing my obstacles than I am at overcoming them. Thankfully, we serve a patient God.